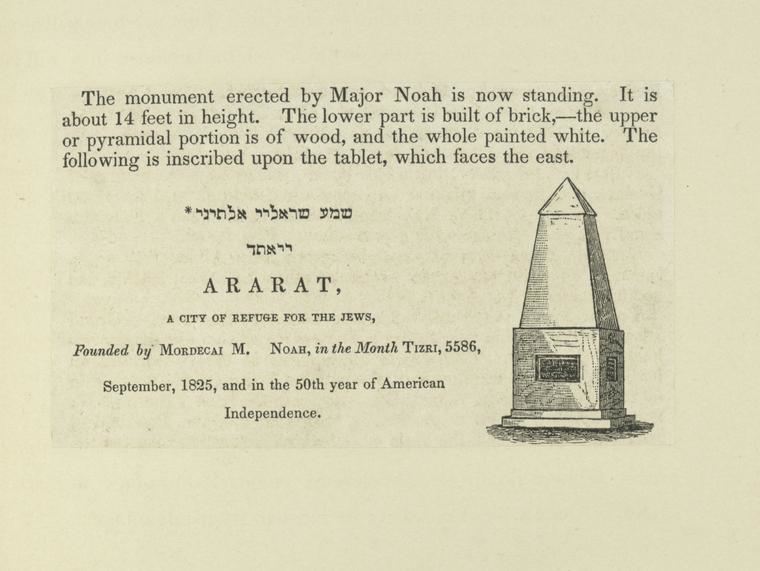 In September 1825, Major Mordecai Noah founded Ararat, “a city of refuge for the Jews” in Grand Island, New York. This turned out to be the first of many failed projects in modern history that sought to carve out a nation for the Jewish people. 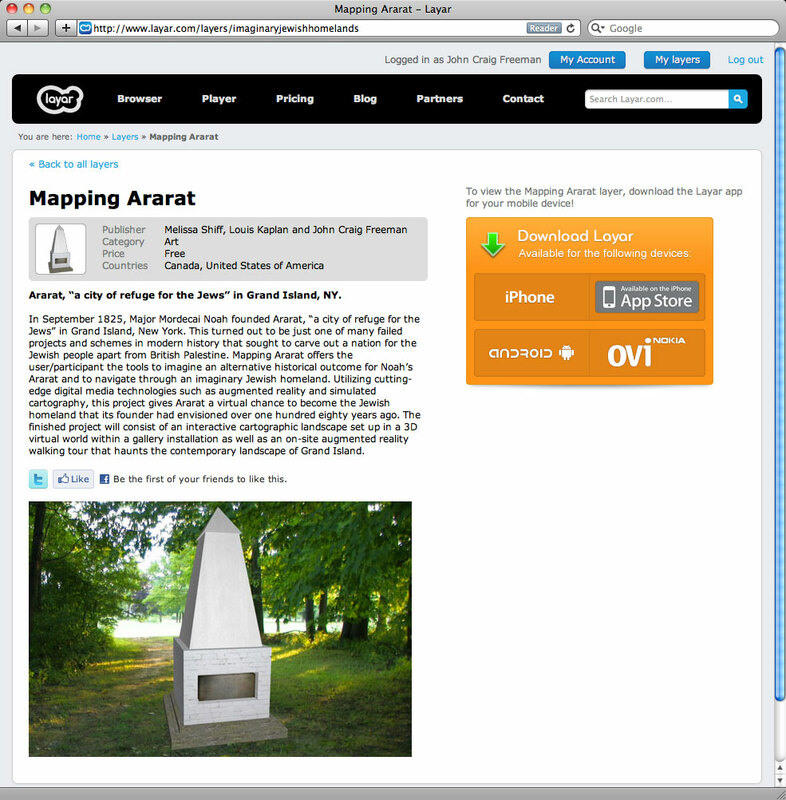 Mapping Ararat offers the user/participant the tools to imagine an alternative historical outcome for Noah’s Ararat and to navigate through an imaginary Jewish homeland. Utilizing cutting-edge digital media technologies such as augmented reality and simulated cartography, this project gives Ararat a virtual chance to become the Jewish homeland that its founder had envisioned over one hundred eighty years ago. 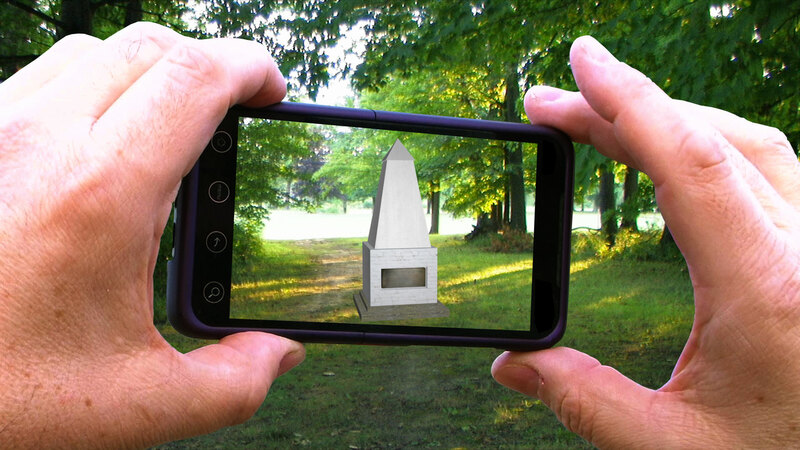 The project consists of an on-site augmented reality walking tour that haunts the contemporary landscape of Grand Island as well as an interactive cartographic landscape set up in a 3D virtual world within a gallery installation. In addition, Mapping Ararat generates the vernacular artifacts common to all modern nation-states whether money, postcards or newspapers. “Ararat AR” is an augmented reality public art project constructed at the very location where Mordecai Noah intended to found Ararat, “a city of refuge for the Jews” in Grand Island, New York. 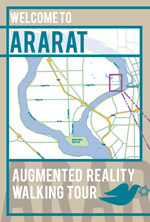 With smart phones in hand, visitors will be able to take an onsite augmented reality walking tour of Ararat. This project allows people to imagine Ararat while experiencing the actual place it would have existed. The public can simply download and launch a mobile application and aim their devices’ cameras at the landscape. The application uses geolocation software to superimpose virtual objects at precise GPS coordinates, enabling the public to see the objects integrated into the physical location as if they existed in the real world. View the project's archive of Site Visit Photographs or Site Visit Videos. First, one must download a program called Layar onto one’s smart phone. This application allows one to see monuments, buildings and street signs where no such architecture or landmarks actually exists. These “assets” are not in the physical landscape; instead they are housed on a server and inserted into the landscape virtually enabling them to be viewed on the screen of a mobile phone. 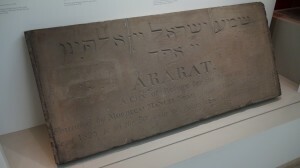 Here you are looking at the Ararat cornerstone that is the only extant object from the period. Here is the drawing that was found in a book dated from 1841 which shows the obelisk used to house the cornerstone. 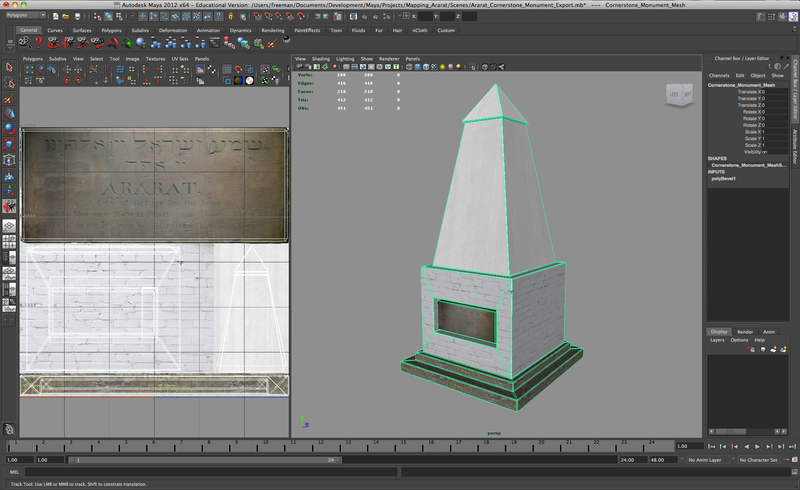 Now you see how we have recreated this form in the 3D modeling program Maya. And finally, you see it in its augmented reality state onsite. GPS technology allows your phone to pinpoint your exact location and our fictive Jewish town will unfold on screen on that very site. Therefore this is an onsite experience where our Ararat tourists encounter such imaginary landmarks as a port of entry, a flag pole, a synagogue, a mikvah, Noah's gravestone, a deli and a Noah’s ark theme park, and many more augments that are inserted into the present landscape. To enrich the landscape even further, viewers also have the capability to access primary source materials drawn from our accumulated archives to provide them with supplementary information onsite thereby allowing for another mode of dissemination of archival materials.